For Martin Luther, God’s action in creation, redemption, sanctification, justification, and prayer are inseparably tied together. Albrecht Peters’ Commentary on Luther’s Catechisms: Creed shows the development of Luther’s thoughts on the persons of the Trinity and their work and provides the needed context for Luther’s interpretation within that of the Western tradition. The following excerpt explores Luther’s thoughts on the First Article of the Creed and the character of the creating and preserving nature of God the Father. As the all-powerful Lord, God does battle, with the help of His creatures, against the princes of this world and their hangers-on; a relentless battle for life in all its dimensions is depicted. In the catechisms, Luther does not describe this in detail in his treatment of the First Article; we need to sketch in the details from his expositions in order to get a comprehensive picture. The creator places His creatures into the battle line: “Deus creavit istas creaturas omnes, ut stent in milicia et sine fine pugnent contra Diabolum pro nobis” (But God created all these creatures to be in active military service, to fight for us continually against the devil; AE 1:74). The battle for life is fought on every level: (1) The lowest level is that of the non-human creatures, which God provides to serve us “for the needs and necessities of life,” which we by contrariness misuse and thus give over to nothingness. (2) The next level up is that of “the temporal, worldly realm, which includes the realm of the household and the authority of parents over their children”; it is the realm of the sword and the fist, but also of the hoe and the plow, the economic and political spheres. God seeks to protect and multiply life in this arena as well. In contrast, by means of “agitators, disobedient ruffians, evil and poisonous advice to princes in their castles . . . tyrants, villains and everything that serves to bring war, discord and destruction of lands and people,” Satan seeks to destroy life. (3) God’s spiritual realm takes matters to a higher level yet, by means of “Word and mouth,” which points already to the Second and Third Articles; Satan awakens “the heretics, false teachers, hypocrites, and false brothers” against this realm of the Word of God. Above these three levels of conflict, the dimension of the principalities and powers is in play. According to Karl Barth, they are what is meant by the term heavens. Luther refers to them in the catechisms, in the petition in the Morning and Evening Prayers: “May Your holy angel be with me, that the wicked foe will wield no power against me.” The angels stand by us; they protect us on the outside and inside, they shield us from harm and disaster and give us good thoughts in our heart and mind; they thus help to “rule Christianity and the world,” in opposition to the dark powers of the realm of Satan. The all-controlling creator draws us astonishingly close to Himself in, with, and under the “masks and masquerades” of His creatures. Taking into account that we are bound to the place where we live, the reformer characterizes this with the shorthand term “ubiquitous”; with respect to the way we are inserted into time and history, he uses the shorthand term “momentous.” Cutting through space and time, God is uncannily close to us and yet continues to keep Himself away from our clumsy attempts to take hold of Him. Luther depicts God’s presence in as real and concrete a way as possible but protects God’s overarching sovereignty at the same time. “De servo arbitrio, 1525,” WA 18:718.28 (AE 33:3–295). “Sach.-Ausl., 1527,” WA 23:513.21 (AE 20:153–347). “Sach.-Ausl., 1527,” WA 23:513.37 (AE 20:153–347). “Pred. über Apk. 12:12ff. vom 29.9.1534,” WA 37:539.28. “Michaelispred., 1539,” WA 47:857.35; cf. “Sach.-Ausl., 1527,” WA 23:511.35ff. (AE 20:153–347), and Seils, Der Gedanke vom Zusammenwirken, 157–69. “Michaelispred. vom 28.9.1531,” WA 34.2:226.25. From Commentary on Luther’s Catechism: Creed, pages 81–83. English translation © 2011 Concordia Publishing House. All rights reserved. 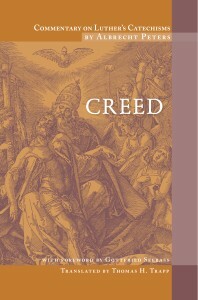 To order Creed, please contact CPH at 800-325-3040 or visit www.cph.org. Albrecht Peters’ Commentary on Luther’s Catechism is a five volume set. The other volumes are: Ten Commandments, Lord’s Prayer, Baptism & Lord’s Supper, and Confession and Christian Life.